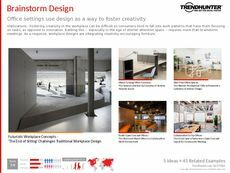 Find Better Ideas, Faster ® with a custom office design trend report, our PRO Dashboard and 80+ categories of premium trend reports. 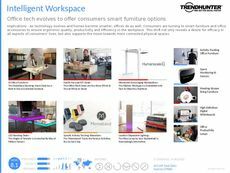 The Office Design Trend Report looks at the use of furniture, setup and strategic layouts that are used to enhance the modern workplace. This report will explore which office designs are being used by which brands to better understand the dynamics of office communities. This report will provide readers with unique insights on major offices such as Google, while simultaneously exploring start-up offices that offer a very different appearance. 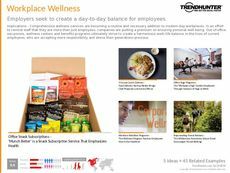 This report focuses on aesthetics as it pertains to office culture. 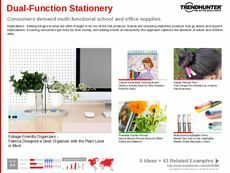 Interior designers will find this report to be an enlightening exploration of office themes that are creating patterns within the design world. It will also be a unique report that can allow company and brand board members to explore how the style and setup of the office plays a part in an overall office's environment. This Office Design Trend Report will allow you to create the best office setup that is reflective of your brand and will create an appropriate atmosphere for your clients and employees.